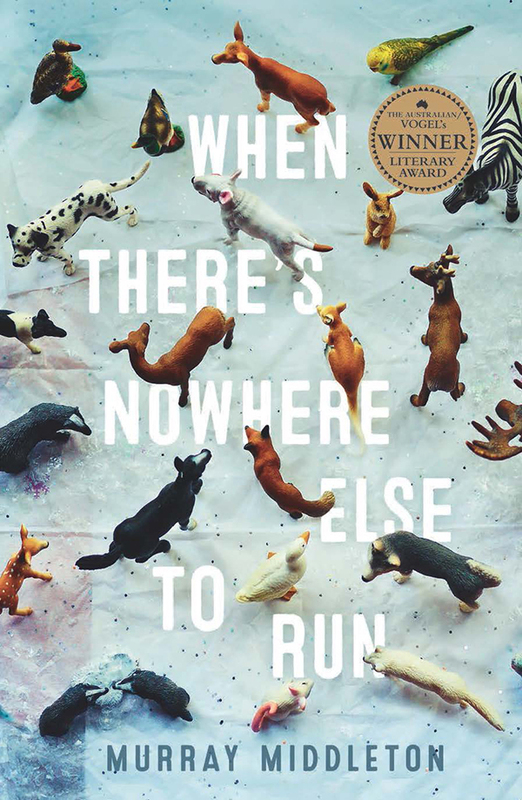 We’re delighted to announce that the 2015 winner of The Australian/Vogel’s Literary Award is Murray Middleton, with his collection of short stories When There’s Nowhere Else to Run. In the 35 year history of the award, this is only the second time a collection of short stories has claimed the prize! At a packed event here in our offices in Sydney, despite the storms outside, a crowd assembled from across the literary world awaited Miles Franklin winner Michelle de Kretser to crown our winner, from the shortlist of four announced at the weekend in The Australian. This moment, it feels so nice, I think I’ll be eternally grateful for that. For someone like me, I’m not very good at networking, I don’t know anyone in the industry, writing short stories is kind of taboo, I can’t think of another way through for someone like me. This award, of which I had a 0.667% chance of winning this year, was extraordinarily good fortune. 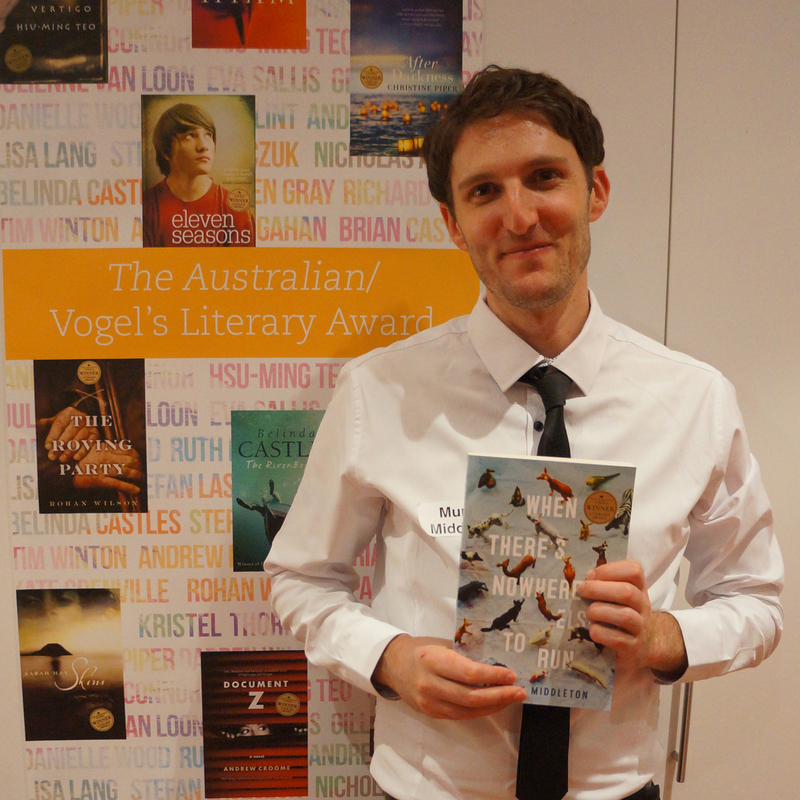 While the 31 year old Melbourne writer won The Age short story contest in 2010, this year’s Vogel’s Award actually proved to be third time lucky for Murray. 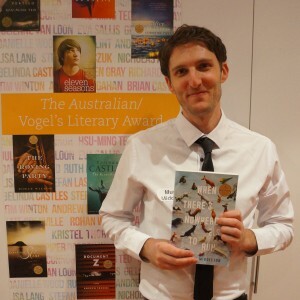 After previous unsuccessful entries, he beat 100 other entrants to the prestigious award, joining past winners like Tim Winton, Kate Grenville, Andrew McGahan and Gillian Mears. 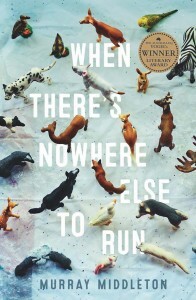 When There’s Nowhere Else to Run is about people who find their lives unravelling. They are teachers, lawyers, nurses, firemen, chefs, gamblers, war veterans, hard drinkers, adulterers, widows and romantics. Seeking refuge all across the country, from the wheat belt of Western Australia, the limestone desert of South Australia, the sugarcane towns of Queensland, the hinterland of New South Wales to the coastline of Victoria, they discover that no matter how many thousands of kilometres they put between themselves and their transgressions, sometimes there’s nowhere else to run. There could only be one winner, and that was Murray Middleton with his wonderful collection of short stories. I think what we saw in that, what we all felt, was that quality that really great writing has. It felt like art. It was deeper, and more satisfying than anything else we read. And I think it was kind of amazing to find that in short stories, we all felt it and all agreed that it was the clear winner. Vivid and compelling, these short stories, which echo the experiences of modern life, are marked by strong settings and scenarios. Title story ‘When There’s Nowhere Else To Run’ nails the pathos and awkwardness of dealing with the loss of a friend beautifully. At the final judges’ meeting at which the winner and shortlist is chosen, I was excited by the judges’ enthusiasm for this collection of short stories. Not since Robin Walton’s Glace Fruits, in 1986, has a short story collection won this award. And of course, when I read Murray’s manuscript, I completely understood their reasoning. Written in a style both spare and rich with meaning, Murray is a masterful observer of life amidst all its emotions. Read an extract with one of the stories from When There’s Nowhere Else to Run below, and you can pick up a copy in bookstores this week, or you can order online at Booktopia, Bookworld, Dymocks, Readings as well as iBooks and Amazon. Hear Murray on ABC RN’s Books and Arts radio show, or watch Booktopia’s video interview below the extract.